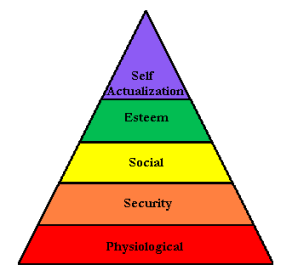 Abraham Maslow described a motivational system of several stages or levels of needs; until a person fulfills lower, more basic levels of needs, she will have no motivation to seek the higher needs. His system is frequently depicted as a pyramid where the base is the lower levels and the peak is the highest. Maslow’s order may not be true for every person and the order he described may be specific to Western culture. If a person has a broken leg and is unable to walk and also has no pulse and is not breathing; perform CPR! The broken leg is irrelevant if he cannot breathe or has no pulse; without vitals he is dead. Once he has respiration and a pulse, address the secondary issue of the broken limb. The world’s poorest two billion people desperately need healthcare, not laptops. Self: Respect, Worth, Confidence etc. Where do religion and spirituality fit? For many, spirituality and religion are often integrated, but this is not true for everyone. Many who consider themselves spiritual avoid organized religion because they find it dogmatic, rule-bound, judgmental, filled with hypocrites etc. Spirituality seems a part of Self-Actualization in its levels of self-awareness and personal development. But religion is present at all levels. Different cultures have different beliefs and rituals. There is a risk of information overload and analysis paralysis with too much study and seemingly endless questioning. But ignorance is only bliss when you are ignorant of your ignorance. Thrust into a relationship crisis, you are all too aware that you don’t have the answers—and that you may not even have the questions. The accumulation of information may not be a need; rather the need is the cessation of the panic mode. Panic is a sudden unreasoning fear in which a person is unable to help himself—notice that the person is unable, it is not a case of refusal. Your confusion is like a cramped muscle and information is the muscle relaxant. Turning to God in times of crisis is primary but I have found that regardless of such necessity there are some people who are unable to relax their metaphorical muscle enough to open themselves up to God. God is a communicator. He may send you messages through your body, through other people, through what you read, hear, see, through your circumstances… God’s manners of communication are infinite and while pain and confusion bind you, He continues to communicate. But you may not be a receptive conduit and His messages may go unnoticed. Information about MLC and Infidelity can free you to receive what the Self-Healing that is a byproduct of communion with God. That does not mean you should stop praying until you are no longer panicking. Communion with God dissolves panic, but it is not the only solvent and not everyone will be open enough for God’s healing solace; pray anyway. You have so many questions. Why is she acting this way? Why does he hate you? How long will this last? What do I do? Will she ever come home? Often the only answer I can provide is I don’t know. But some will tell you that your questions are wrong, or you shouldn’t ask them that you should turn to God for answers; this is what I heard. I was turning to God. I was in a constant state of prayer and God was helping. But I needed more direct answers. I don’t know was an acceptable answer because it was honest and didn’t imply there was secret. There are also general answers that give a variety of possibilities based on other peoples MLC journeys. Those answers don’t mean the same things will happen in your situation, but they could and thus the information may be helpful for your preparation and understanding. Turning to God does not mean you must turn away from your questions or other informational resources.